Editor’s note: Martin Macmillan is CEO and co-founder of Pollen VC. With 1,600+ apps making their debuts in the app stores daily, the pressure is on app developers to stand out from the crowd and acquire users at scale. However, app developers aren’t the only ones feeling the strain. The tremendous growth of the global app economy — powered by more than 2.5 million apps in the App Store and Google Play combined — is also stretching traditional app marketing and monetization models to their limits. Squeezed by user acquisition costs and pressured to deploy other tactics to raise their profiles, app developers are forced to spend more on app installs and campaigns in order to hit a high app store rank and increase visibility among their target users. At one level, it’s all about the numbers. 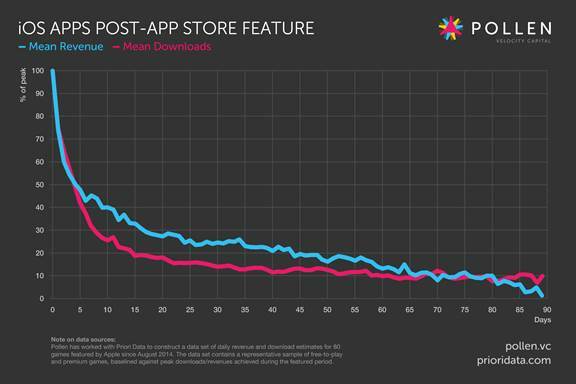 More apps in the app stores means user acquisition costs are going through the roof. In fact, a new report from app marketing technology provider Fiksu claims the costs associated with retaining a “loyal user” – that is, someone who opens an app three times or more – have jumped 21 percent to reach $2.25 in September 2014, up from $1.86 in August. Year-over-year, the figure has risen by 34 percent, and costs skyrocketed during the holiday season as they do every year. At the other end of the spectrum, the culprit is the “discovery dilemma,” which is intricately linked with the inability of app store search engines to expose users to the long tail of apps. Since users can’t download apps they don’t know exist in the first place, the vast majority of them will remain virtually invisible. Further app store research underlines this imbalance, revealing that only 5 percent of apps accounted for 92 percent of all downloads in 2013. Caught between a rock and a hard place, app developers are forced to pursue a pay-to-play strategy aimed at boosting user acquisition through spending to reach top chart positions. In many cases, the need for speed means app developers are burning VC money before their assumptions about user acquisition metrics — and the money their app will generate — can be borne out by hard data. It’s also an approach that Harry Briggs, a principal at Balderton Capital, tells me is raising the level of concern among VCs who must watch as startups throw investment dollars at user acquisition approaches in hopes of hitting it big. Balderton, which has invested in Wooga, Natural Motion (recently sold to Zynga) and Big Fish Games (recently sold to Churchill Downs), has a first-hand understanding of the tremendous effort startups must invest to produce a hit app. For this reason, Briggs advises startups to deploy marketing investment only once they know they have a hit on their hands. Significantly, cash — earned or otherwise — is not enough to achieve the massive volume of downloads needed to rocket an app to the top of the charts. App developers also have to achieve a high rate of app installs and continue investing to sustain this level, or risk an outcome that will see their high-flying app end up on the heap long before its time. To ease the squeeze on resources, many app developers on a tight budget are embracing cross-networks to acquire users at scale and on the cheap. In practice, cross-promotion allows app developers to advertise in each other’s apps via advertising placements within those apps, making this approach a particularly effective way to gain visibility and users. But some clever cross-promotion models are determined to power an economy, not an app exchange. A good example is Tapdaq, a newcomer cross-promotion network catering to long tail and indie developers too small to pay commissions or meet minimum traffic requirements. To level the playing field, Tapdaq has introduced its own currency (called “daq”) that developers can earn by installing, reviewing and/or promoting apps from other app developers in the community. Thus, the more app developers do to promote the apps of others, the more daq they earn to spend on their own campaigns. Timing is critical and missing a step post-feature or an expensive burst campaign to acquire users can make or break an app, according to recent internal research we’ve conducted in collaboration with Priori Data, a mobile application market analytics company. The data, based on an examination of 40 free-to-play and 40 paid iOS games featured at launch in the App Store since July of this year, shows that both daily downloads and revenues for app developers following an app store feature, fizzle out within a matter of weeks. Findings show that on average, daily revenues post-feature fell by more than 75 percent within 30 days and then by more than 85 percent after 60 days. In one case, a successful paid app plummeted from daily revenues of $60,085 to $1,899 in just 35 days. A freemium app saw a similar drastic decline, dropping from $14,783 to $662 in the same period. Connect the dots in the data and it’s clear that what was a high tide of app revenues can reduce to a trickle within a matter of days. Ironically, this is the same period in the app life cycle when startups should double down on user acquisition and rapidly reinvest their earned revenues in order to win more users for their apps. However, this is also the period when startups can run out of steam waiting to get paid for their app sales or in-app purchases from the leading app stores. In many cases the lag time between making a sale and getting paid by the app store can be up to 60 days or more, which can seem like an eternity in the mobile world — particularly for bootstrapped startups. App developers are faced with a tough choice during the critical period between the time that an app developer chalks up an app sale or in-app purchase and the actual date that app stores pay out. They can either deploy their venture funding to acquire more users, or they can watch as their leading app slips into the ranks of the also-rans. In the burgeoning app economy, winning is about maintaining real momentum, not attaining fleeting fame.